The terms Current Balun and Voltage Balun are often used. This article explains the key characteristics that determine which best describes a particular balun. The approach take is to charaterise a balun because of how it behaves externally rather than the internal implementation. The discussion in this article is for signal flow from the unbalanced side to the balanced side. Balun loads are often though of as a simple two terminal device. That is actually quite inadequate, they should be thought of as a three terminal load which can be simplified to a delta or wye equivalent circuit and one terminal of that network is connected to the unbalanced input 'ground' terminal. Baluns may appear ideal if they are driving an isolated two terminal load, and there would be no need for a balun if that was the case. Common mode current is the difference between the output terminal currents, it flows to the unbalanced input 'ground' terminal. An ideal current balun delivers currents that are equal in magnitude and opposite in phase. A good current balun will approach the ideal condition. It will deliver approximately equal currents with approximately opposite phase, irrespective of the load impedance (including symmetry). Common mode current will be small. If the load impedance is not symmetric, then the voltages at each output terminal will not be equal in magnitude and opposite in phase. A parameter often used to quantify the effect of a current balun is its common mode impedance or choking impedance. An ideal current balun has infinite common mode impedance, a good one has very high common mode impedance (typically thousands of ohms for an effective general purpose balun in an antenna system). An ideal voltage balun delivers voltages that are equal in magnitude and opposite in phase. A good voltage balun will approach the ideal condition. It will deliver approximately equal voltages (wrt the input ground) with approximately opposite phase, irrespective of the load impedance (including symmetry). Common mode voltage ((V1+V2)/2) will be small. If the load impedance is not symmetric, then the currents flowing in each output terminal will not be equal in magnitude and opposite in phase. An ideal voltage balun has zero common mode impedance, a good one has very low common mode impedance (ohms). A balun cannot be a good Voltage Balun and a good Current Balun at the same time, it is one or the other, or neither. An ideal balun performs an ideal impedance transformation, nominally 1:1 unless specified otherwise. Practical baluns depart from the ideal, and the departure is often specified as Insertion VSWR. It is possible to design a balun to not only facilitate the unbalanced to balanced transition, but to perform a nominal impedance transformation (eg 4:1 is common). Voltage Baluns and Current Baluns are both capable of impedance transformation other than nominally 1:1.
reducing radiation from an antenna feed line by ensuring that the currents in each feed line conductor are nearly equal but opposite in phase. some audio applications where rejection of common mode voltage injected into a source is important. 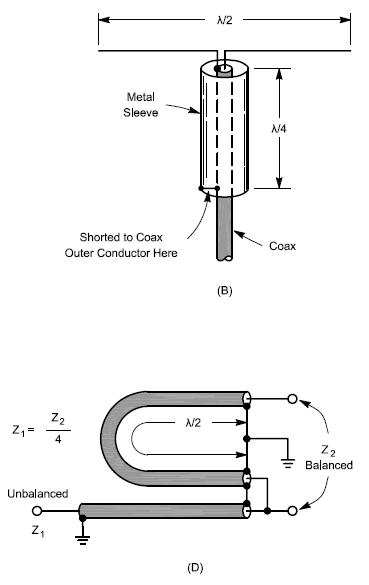 Above are two baluns from the ARRL Handbook, neither uses a magnetic core. The second also performs 4:1 impedance transformation. Classify each as a Voltage Balun, Current Balun, or neither. Why?